In your daily life, would you voluntarily sit down to write an analytical essay on The Odyssey? Or on Catcher in the Rye? Probably not. Would you like to read and grade more than one hundred identical essays about these novels instead? Probably not. So, why do we ask our students to this year after year? Today on the Heinemann Podcast, authors Allison Marchetti & Rebekah O'Dell explore alternatives to the dreaded literary analysis essays in their new book, Beyond Literary Analysis. Allison and Rebekah explore the meaning of analysis from an entirely new perspective, in hopes of challenging traditional notions of what students should be analyzing and how they should write about. They want student writing to be where passion and analysis meet by redefining the meaning of the word "text." We began our conversation discussing how this new understanding of analysis came to be. Rebekah: On the sofa watching Game of Thrones. Allison: Yeah. And I had a stack of Catcher essays, I think, and I just didn't want to even look at the first one. So, we were sort of commiserating and Rebekah's always texting me these great analysis pieces of pop culture, and the TV shows we're watching. So, we started texting some links back and forth, and then what happened next? Rebekah: Then we said, "You know, I wish this is what we could grade." Rebekah: "I wish we could read 150 pieces of analysis by Linda Holmes, or something from Vulture, rather than reading these pieces about the Catcher and the Rye." So, that's sort of what started us thinking and talking together about could we do that? How could we make the analysis our kids need to write in class more like the kind of analysis that lives in the real world that people choose to read, and people love to read, and people re-tweet because it's so interesting and smart. We knew that there must be a bridge to get our kids there, so that's what we started trying to figure out. Allison: The stuff that makes people jump off the sofa after a show ends, race to their computer to see what other people are thinking around that show. Why couldn't our kids do that? We thought that they could, and so we wanted to figure out how. Allison: What would that look like. That was our next text, I think, "what would that look like." Brett: Well, and in Chapter One, you immediately point to a beautiful model from The Atlantic that you found written on The Odyssey. Talk a little bit about how that influenced you and sort of led your thinking. Rebekah: What we started thinking about ... in high school, especially, but even in middle school to an extent, so much of the writing that teachers feel compelled to teach is literary analysis, you know, that's sort of traditionally been the bread and butter of secondary English class writing. We were convinced that it does exist in the real world, but it doesn't look like a five paragraph essay. It doesn't look like the kinds of formulas and models that we so often give students, because we don't know what else to give them to help them along. The essay that we share in Chapter One is written by Anna North. It's about a text that meant a lot to her, which is The Odyssey. She does analyze the text, she does do close reading of a passage of Homer, but then she also broadens that and she analyzes how that affected her life, and how she connected to that text. It creates this beautiful, rich, personal piece of writing that's every bit as rigorous and every bit as thoughtful as the kind of literary analysis we hope our students are going to write. But, it's also so much more engaging. It's so much more meaningful to the reader, but also to the writer, because they have brought their whole selves to this piece of writing. Allison: We had this question, what would it look like to help our students be able to write this kind of writing. Whenever we want our students to do a certain kind of writing, but we don't know how to do that, we go into the wild. We found Anna North's essay, we looked everywhere: Locks, Slate, The Ringer. We started studying analysis in the wild to see what it looked like, how it was put together, and then we tried to figure out how we could bring that into our students' writing. Brett: Why was that important? Why was it important to take that bigger view of analysis? Rebekah: Because it's authentic, and it's real. We're always asking ourselves the question, what are real writers making? The answer is that. It's the Anna North essay. It's the stuff that, again, makes us get off the sofa and race to the computer to see what people are saying about Game of Thrones. So, it's real, it's fresh, it's lively, and we think it's really important to bring that stuff to our students and invite them into that world. Brett: In talking about racing to the computer and Game of Thrones, specifically, you have taught us in this book to broaden our definition of text. How have you broadened it, and why is that so important? Rebekah: For us, a text is anything that has a beginning, middle and end, and can be broken down into smaller pieces, and closely studied. That allows us to do so much more real world analysis than just a novel. Now, Steph Curry's performance in last night's basketball game can be a text. It has a beginning, middle and end, and we can break down the different moves that Steph Curry made, and we can analyze those. Then, we can write and think about those. It allows us to look at video games as a text. Movies, books, music ... all of the things that make up life. Something that's always so important to us is that our students know that in our class they are never just doing school assignments. They are doing the writing of life. This is, everywhere we turn, it's this kind of writing - it's an analysis of a political speech, or of a teen's season so far. By broadening the definition of text, we connect our students so much more with the real world of writing. We prepare them for the world that's beyond high school and college so that they can participate in that conversation. Allison: When you broaden the definition, you invite, as you said, more of the world in. 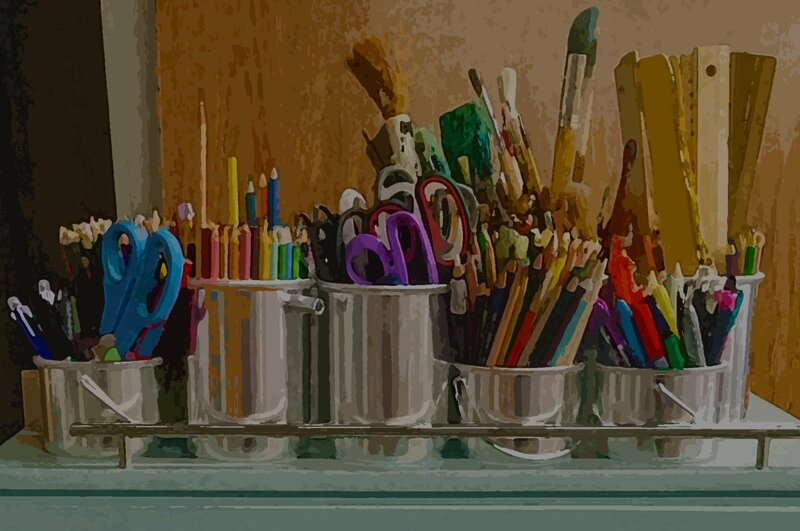 You also invite your students back into the classroom space, and you help them connect with their passions when you broaden the definition of text. Rebekah: That was the thing that we were finding is that we had students who didn't really care about The Catcher and the Rye, and certainly didn't want to write about it. But they knew everything about a video game. They could speak so intelligently and write so thoughtfully about a video game in a way that they couldn't about literature because literature wasn't their passion. Then, we have students for whom literature is their passion. We have students for whom it's dance, and they want to write an analysis of a dance performance. When we allow kids to bring those texts into the classroom, now they are experts. Now, they have the expertise to actually do the heavy lifting of analytical writing. Allison: And speaking of what real writers do, I mean real writers tend to write about what they love. The guy whose consistently analyzing Game of Thrones is a lover and a follower of that show. We wanted the same for our kids. Brett: You reference Don Murray quite a bit in the book, and I love the quotes and the references, and how you look at literacy ... or, just the more traditional text through that lens of Don Murray about how a student hasn't lived the life yet to really appreciate the literature. I felt that was really sort of an important thing to touch on. How did you connect those dots from Don Murray to what you're doing in this book? Rebekah: Interestingly, we kind of connected those dots through Tom Newkirk. Rebekah: Which, is where all of our stories sort of start and end is with Tom Newkirk and text messaging. You know, we were talking with Tom Newkirk about this idea that we were trying to figure out how to get our kids to do this kind of work in a more authentic way, and he said, "Well, of course they can't write literary analysis. They're not content experts. Their teacher is a content expert on literature, but they are not content experts. They're content experts of all these other things." So, that was a huge "A-ha" moment for us when we thought when we ask students to do traditional literary analysis, they're writing about a theme of The Scarlet Letter. We're asking them really to do two very challenging things at once. We're asking them to understand The Scarlet Letter, and interpret it and pull out all the nuance of Hawthorne's language, and then we're also asking them to do this very cognitively difficult task of analyzing a text through writing, and figuring out their ideas and the structure of that writing, and all the things that go along with that. So, I think what we have so often done is we've watered down both in order to get the students to do something that's a little bit successful, right? We kind of like feed them the themes of The Scarlet Letter, and we feed them the symbols, and then we give them a hand-out with blanks for their thesis statement, and their topic sentences, because in our hearts, what we want is for them to be successful at this piece of writing. When we instead flip the script, and we say, "We are experts on teaching writing. You get to bring your knowledge. You get to bring the content to us," suddenly we all can focus just on that analytical writing, which is so important for the rest of their lives, being able to make a claim and support it with evidence and structure and argument. So, that conversation with Tom was really just pivotal in our thinking about this. We said, "We need to find where they're content experts, and that's what they need to bring to the table." Then, we aren't trying to teach them everything at once. We're trying to teach them the writing. Rebekah: And to test their knowledge of the literature. Allison: And to test their knowledge, yeah. Of plot, characterization ... but they're not really doing any sort of rich thinking in writing. Rebekah: Or, discovery, which is really what should be at the heart of all writing, but especially analytical writing. The thing that should come out of it is that you know more about the text when you're done writing than when you began. But, when the kids are struggling with the text to begin with, we never get there. Brett: Your goal really is to get students to a place where they're writing with authority. Rebekah: Yeah, authority is key, because when we read a piece of political analysis, or sports analysis, or even film analysis, it's clear that that writer for The New York Times knows his stuff. He knows what he's talking about, and brings all of this authority to the table, which is why we listen. That's why read. That's why we run to the computer to read it. We have to figure out how to give our kids that same authority with which to write. Rebekah: And you're driven by fear. Allison: Yeah, you're driven by fear. When our kids are invited to write about what they are experts on, and what they love and are passionate about and actually have something to say about, that's a really beautiful thing. Rebekah: But we also in the book a lot about adding authority to what our students ... they bring a lot to the table when they are writing about their passions, and they are writing about the things they know so much about. Also, we offer in the book strategies to even boost that up some other notches, because it's actually kind of fun and easy to teach them how to use the jargon of this discipline in their writing, how to polish their writing in a way that makes it seem like they are a really confident writer. Allison: A good example is a lot of our students love music, right? I mean, they are listening to it in our classrooms, and we don't even know. But, they don't know how to talk about their love of music. So, that's an instance where there is so much passion, but little authority. It would be our job to come in and really focus on the tools of authority so that they could blend the two into their writing. Brett: This is a good time to sort of work through how you've broken down the book, because it's really quite user friendly the way you sort of broken the book down. Brett: Walk us through it. Allison: So, the book has three parts. Part One is your theory and a conversation about what we're trying to do, which is really broaden the definition of text, and also create an understanding for why a literary analysis-only diet just doesn't cut it anymore. Part two is ... I think my favorite part, even though it was the hardest part to write and to think about, but Part Two is where we basically gives the reader four tools of authentic analysis, and those tools are passion, ideas, structure and authority. We talk about those tools and we give a lot of techniques for helping students access those tools. We also provide tons of mentor texts to show those tools, I guess, what it looks like in the wild. Rebekah: The awesome thing about these tools is that they're completely transferrable. So, whether you're analyzing the theme of a video game, or you're analyzing George and Lennie's friendship in Of Mice and Men, or if your student goes to history class and needs to analyze the causes of The Cold War. Passion, ideas, structure and authority will help them get there and craft meaningful writing. We structured Part Two in the hopes that you could leave this book on the corner of your desk and quickly find what you need to help a student on the spot. So, we begin each chapter in Part Two with a chart that matches the strategies that we're going to present with the problems students might commonly encounter in this kind of writing. That way, you can find exactly what you need at a moment's notice. In each Part Two chapter, we start by sharing some activities that you could engage the whole class in, or a small group of students, that will help them make discoveries about the way that that tool can impact their own writing, and then after the activities, we move into crafting techniques that are actually going to help kids put words on the page in sophisticated and nuanced and interesting ways. Allison: Part Three is a really fun, super user friendly part. Kind of a primer on all these different types of analysis, from sports analysis to TV and film analysis, literary analysis ... what else do we have in there? Rebekah: Where to find this kind of analysis. Allison: Where it lives. Great mentor writers to follow, the people who are really doing this thing really well. Rebekah: Some common kinds of analysis within that sub-genre. Because, you know, whenever you make a leap in your classroom, there's fear. It's a big risk to throw away the way you were taught, and the way that you've been teaching, and to do something totally new. We felt that fear, too. We feel that fear. So, in Section Three, what we want to do is sort of be your best friend and hold your hand a little bit while you take that leap, because we know nothing ... well, very little, about sports. Before we wrote this book, we knew absolutely nothing about video games, but we have kids who want to do that writing. In Section Three, what we're trying to give you ... and it's mostly ... Section Three is mostly for the teacher, is a series of sort of just touchstones. I have a kid writing video game analysis. I don't know what he should be doing. I don't know what good writing would look like. I don't know what topics he should be covering. That's what we give you in that section, so that you can help that student and come along beside him and feel a little bit of confidence that you know what to expect. Brett: Speaking about the fear, you write right in the book, "This is scary." And then you give us a guide of the things that we should be focusing on, which is really great. So, how can teachers help students identify those topics for analysis? Because there is a lot that you've covered here between sports, video games, even fashion. There's different things, so how can we help them narrow it down and focus on the topics? Rebekah: I think that, in large part, most of your kids are going to know. They're going to know what they love. What we do a lot of is sort of giving them a tour. Here are a lot of different kinds of analysis. Here's a piece of video game analysis. Here is a TV series analysis. Here is a TV episode analysis. We just show them what kind of analysis lives in the world. I think for probably 95% of students, that's enough. They know what they want to write about. They know how their favorite show ever was iCarly, or something. Then, there's always that 5% who are like, "I don't like anything. I am interested in nothing. I go home and stare at the wall." In our chapter on passion, we do a lot of work to provide strategies to help teachers dig that out of kids. Even the kid who comes in knowing exactly what they want to write about, sometimes through those strategies, through going some activities and experiences to identify topics they are interested in, they'll discover something new that they are like, "Oh, yeah. I do want to do that." So, we think about helping them dig through their past to find the things that they were in love with when they were little. Sometimes, that can bring a lot to the table, even for that most reticent kid. We do work to think about ... just digging through their backpacks and their cars, and their cell phones. Their passions live everywhere all over them, and all around them. Sometimes they just don't see that yet. We spend a whole chapter just thinking about how to get kids to put on those goggles of passion, and see what they really care about and how to pull that out. Brett: I think the really important message that you have in this book, is that students have interesting things to say. Allison: Absolutely. I think that's always been our message. The student who is tasked with writing a memoir and thinks his life is not interesting. Well, it is, and just the task of writing about a small moment elevates that small moment. That's what we want for our students with analysis. We want them to mind their lives for the things they love, and to elevate those things through analysis. They can do that. Brett: Katherine Bomer was also an inspiration. You had a lot of inspiration going into this book. Tell us where you were pulling that inspiration from. Allison: I think when we write with Heinemann, a lot of us are talking to one another through our books. Yeah, you will hear Katherine's voice, and you will hear Roz Linder's voice. Roz, for instance, really helped us with how to structure our book. Part Two was a problem child, and we took ourselves on a writing retreat in March, I think, with a June deadline, and discovered over the period of 24 hours, that Part Two had to be rewritten from the ground up. We were looking for mentor texts. What are some other ways to organize this and make this more useful for our readers, and Roz Linder's Big Book of Details was the answer to that question. Sometimes, it's in structure inspiration. Rebekah: With Katherine Bomer, we love her writing, but we also specifically love the way that she kind of overturns familiar genres: memoir, and essay and says ... actually, it's something a little bit more than what we've been doing. So, just that idea was a huge inspiration for us thinking about analysis. How is it different than the way school has traditionally conceived of it. Allison: She reminded us that we write to discover, and what we were seeing in traditional literary analysis instruction was very little discovery and a lot of regurgitation, and just sort of mastery of content. So, we wanted to figure out how to help our students make those discoveries again, and she reminded us that we needed to keep that at the forefront. 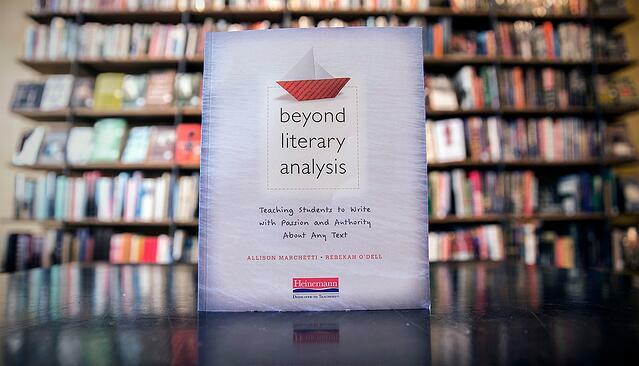 To learn more about Beyond Literary Analysis and download a sample chapter, visit Heinemann.com. Allison Marchetti teaches high school English in Richmond, Virginia. A graduate of the University of Virginia, she is an experienced teacher in both independent and public schools, from inclusion classrooms to AP and IB. A past presenter at NCTE, Allison is coauthor (with Rebekah O’Dell) of the popular blog movingwriters.org, as well as the professional book Writing With Mentors. Both the blog and book were inspired by Tom Newkirk’s call to young teachers at NCTE 2012 to “carry the torch” of Don Graves’ work to the next generation of teachers and students. You can follow Allison on Twitter here. Rebekah O'Dell teaches high school English in Richmond, Virginia. A graduate of the University of Virginia, she is an experienced teacher in both independent and public schools, from inclusion classrooms to AP and IB. A past presenter at NCTE, Rebekah is coauthor (with Allison Marchetti) of the popular blog movingwriters.org, as well as the professional book Writing With Mentors. Both the blog and book were inspired by Tom Newkirk’s call to young teachers at NCTE 2012 to “carry the torch” of Don Graves’ work to the next generation of teachers and students. You can follow Rebekah on Twitter here.